The Simrad GO7 XSR bundle includes a TotalScan transom mount transducer, 3g radar and a Navionics+ chart for inland and coastal US. It’s the perfect bundle for anyone looking for these technologies on a single 7” display. 7” Chartplotter, Radar and Sonar! 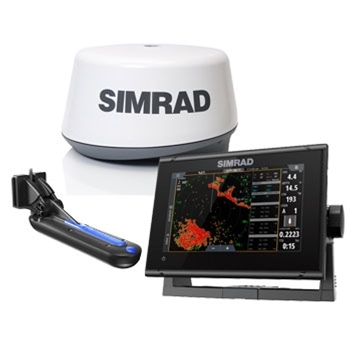 The Simrad GO7 XSR with Totalscan and 3G Radar bundle offers an easy to use 7 inch multi-touch interface and exceptional sonar and radar views. Save up to 6000 waypoints, up to 500 routes, and 50 tracks with 12,000 track points ensuring that no matter how many favorite fishing spots you have, you can easily store and access them all right at your fingertips. An intuitive touchscreen control allows you to customize pages, split screens to view what matters most to you, move quickly on the map screen, and enter waypoints flawlessly. A built in 10hz GPS receiver quickly acquires satellites showing you on the map moving seamlessly on the display with little to no delay, ensuring that you always know where you are going and what your surroundings are. 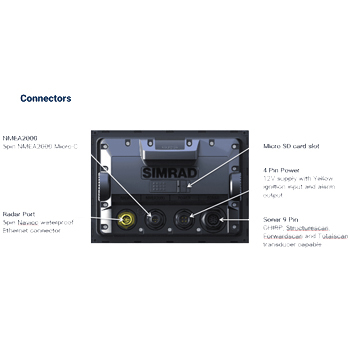 Included with this bundle is the Simrad 3G Radar which is an ideal solution for sailboats, smaller center consoles, or any other vessel with limited on-board power. This broadband radar produces close range performance down to 200 ft. while still delivering a solid state radar image for unsurpassed clarity, detection, and separation of targets at ranges up to 24nm away. This 3g radar will help you navigate through crowded marinas, poor visibility areas, and will display weather cells beautifully on the GO7 XSR display. Your Simrad GO7 XSR will come packed with C-MAP Insight Pro charts covering the US providing you with coastline detail, depth contours, and navaids for lakes & coastal use as well as Navionics + Nav Charting for coverage of coastal and lake waters throughout North America. 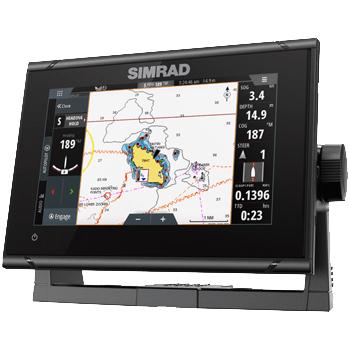 Simrad also built this unit to give you full range to expand to other mapping options such as C-MAP Genesis, NV Digital Charts, Navionics mapping & more. The built-in wireless connectivity allows every user to gain access to online services including map and software updates when connected to a wireless hotspot. Easily connect a wireless device to the GO7 which will allow for full control of your GO7 display from virtually anywhere on the boat when paired with the compatible App! Bluetooth connectivity allows for music streaming when your GO7 is connected to the compatible SonicHub2 device, making this MFD an onboard entertainment hub. The included TotalScan Skimmer Transducer provides both DownScan/StructureScan and CHIRP frequencies which will provide any angler with the best images of species and bottom topography. Operating on multiple frequencies such as 83/200 kHz, 455/800kHz, and offering med/high CHIRP frequencies, you are sure to get the clearest images of what’s below and on either side of your vessel, confirming bottom contours and depths along with clearer fish arch images as well helping you locate the hottest fishing spots. If you are looking for a unit that is a powerhouse of features and clarity, look no further, the Simrad GO7 XSR with TotalScan and 3g Radar is all you need! Sirius XM Weather Compatible with WM-3 Weather Module. Includes Navionics+ and C-Map Insight Pro Charting. Designed to Power Your Outdoor Adventures! The Nocqua 10Ah Pro Power Kit with Rechargeable 12V Lithium-Ion Battery Pack is rugged and water resistant. Rated for all 12V devices, the Nocqua Pro is the perfect solution when needing a lightweight power supply on the trail or on the water. The Lowrance WM-3 is plug and play compatible with the Lowrance HDS Gen2, HDS Gen2 Touch, HDS Gen3 Touch, Simrad NSS, NSE,NSO series and GO7XSR, GO9 and GO12 plotters. Providing up to the minute weather information so that you are prepared before heading out to sea. Up to 220 audio channels can be controlled on the screen of your Simrad or Lowrance plotter as well. Order Now Through December 31st, 2019 and Get Your First Two Months of Subscription Free and a $100 Mail-In Rebate From SiriusXM! Lowrance 4-Way NMEA 2000 Block is the perfect solution when networking and multiple drop cables are in close proximity. No need for multiple T- Connectors, offers a more cost effective and streamlined solution. Part # 000-12612-001 replaces part # 000-10996-001. Combine a large 9-inch display with CHIRP Sonar and a 4G radar and you get a full system, ready to go out of the box! Simrad’s GO9 XSE with Splitscreen allows you to view sonar charting and Radar all at once! Packaged with Active Imaging 3 in 1 transducer, 4G Radar and C-Map Charts for both coastal and lake waters throughout the U.S.